Joella G. Yoder. Unrolling Time: Christiaan Huygens and the Mathematization of Nature. Cambridge University Press, 1989. This case study examines the interrelationship between mathematics and physics in the work of one of the major figures of the Scientific Revolution: the Dutch mathematician, physicist, and astronomer, Christian Huygens (1629–1695). 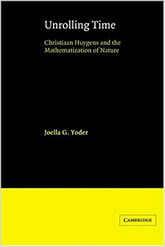 Joella Yoder details the creative interaction that led Huygens to invent a pendulum clock that theoretically beat absolutely uniform time, to measure the constant of gravitational acceleration, to analyze centrifugal force, and to create the mathematical theory of evolutes. In the second half of the book, Dr Yoder places Huygens’s work in the context of his time by examining his relationship with other scientists and the priority disputes that sometimes motivated his research. The role of evolutes in the history of mathematics is analyzed; the reception of Huygens’s masterpiece, the Horologium Oscillatorium of 1673, is described; and finally, the part that Christian Huygens played in the rise of applied mathematics is addressed.